One of the most intuitive multi-effects pedals yet, with a superb array of amp models. Touchscreen is a joy to use. Not the best-stocked effects roster. Fairly bulky given the number of footswitches. 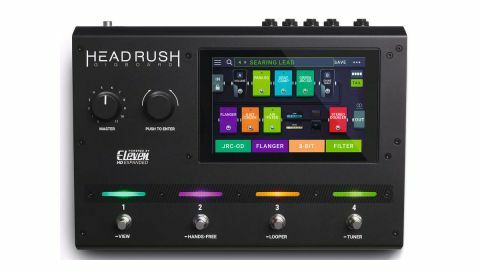 HeadRush’s Pedalboard floor processor released in 2017 was seen as a worthy if familiar competitor to Line 6’s market-dominating Helix multi-effects pedal. In 2019, the two units have diverged: Line 6 stripped out the amp models for the HX Effects, then downsized the Helix into the arguably too-small HX Stomp. HeadRush, meanwhile, has delivered just one smaller offering, the Gigboard, with the same range of effects and amp models, plus touchscreen functionality, in a perfectly proportioned format. Given the touchscreen’s ubiquity in our everyday lives, its appearance here is super-intuitive. Rearranging your signal path and setting up presets is a cinch, and there’s even a nifty hands-free mode that allows you to use footswitches to adjust parameters. Those presets, by the way, are known as rigs, each of which possesses 11 slots for amps, cabs and effects. A rig can be saved in a setlist, which you can tailor to a particular gig - handy for guitarists pulling double-duty in original and covers bands. Now, let’s be clear: the Gigboard doesn’t have nearly as many effects as Line 6’s offerings - fans of the synthier end of things will be disappointed - but in terms of essentials, it’s capably equipped. There’s a hearty assortment of amps, including the classic Fender, Marshall and Mesa/Boogie models, plus an impressive range of rotary and modulation options. Reverbs and delays are a little thin on the ground, but the depth of parameter adjustment should ensure they still cater to most guitarists’ needs. There’s a 20-minute looper with speed and reverse functions, too. Aside from the usability, what really sells the Gigboard is its amp-like feel. The Plexi emulation is authentically touch-sensitive with solid volume knob clean-up, while gainier JCM-alike offerings capture the sag and push of the real deal - best demonstrated on the cornucopia of presets, which span Motown to metal. If you’re a function player, you could capably cover most sets without creating a single preset of your own. But what we love most about the Gigboard is how much fun it is to use - and that’s something we very rarely say about multi-effects processors. We haven’t even mentioned the brilliant looper’s reverse and speed-altering functions or the formidable build quality. If amp sounds are more important to you than effects, we’d plump for the Gigboard over its competitors - although we’d argue it handles cleaner tones better than higher gain settings. Provided it fits your sonic bill, this is a pro-level piece of kit that will simplify the way you record and play live.